Whether you’re a new leader or an experienced one, it helps to articulate your own set of personal leadership maxims. These maxims provide you a touchstone you can refer to every day to remind yourself how you want to show up as a leader. During the session, you will have in-depth discussions on these aspects of leadership. You’ll also create your own set of maxims you can apply the minute you leave the room. The target audience for this course is anyone in a leadership role no matter how large or small. Participants must have a desire to understand themselves as a leader and must want to better define and create consistency around their leadership style. 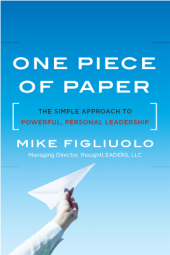 Please contact us to arrange for this course to be trained at your organization or to have Mike Figliuolo come deliver a keynote presentation on the topic at your event. Don’t listen to our opinions on the course – listen to past participants!